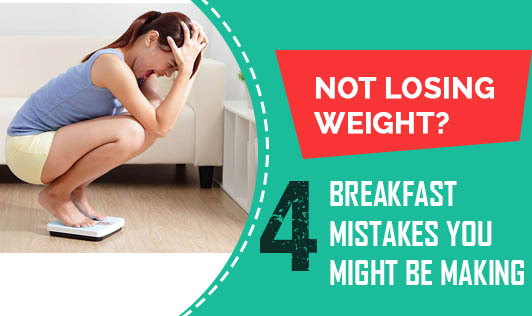 Forgoing breakfast may seem like a calorie-saver, but it can actually be a fat trap. Turning down treats becomes harder, and you’re likely to make up for the missed calories (and then some) with junkier choices later in the day, when it’s tougher to burn them off. The makeover: Commit to eating something every morning. If time is an issue, stash a healthy energy bar containing fruit in your bag. Grabbing a blueberry muffin with your coffee may not seem so bad, but a typical bakery muffin packs more added sugar than you should have for the entire day—a staggering 44 grams. According to the American Heart Association, women should top out at about 12 grams of added sugar daily (that’s 3 teaspoons’ worth). The makeover: You don’t have to completely avoid sugar if you need a jolt to get going. Chop up one tasting square of dark chocolate and mix it into your oatmeal.Also, make fruit your friend: Blend up a smoothie or fold fruit into yogurt or oatmeal. You can also top toast with mashed avocado or almond butter, then slices of fresh figs or pears. Only 8 percent of urbanites eat the recommended amount of fruit each day (2 cups, for a moderately active woman) and just 6 percent hit the mark for veggies (3 cups). So even if you have a nutritious egg-on whole-wheat sandwich in the morning, not fitting in some produce may keep you from reaching the daily goal. The makeover: Get at least one serving at breakfast by grabbing a piece of fruit before you head out the door. For more, add vegetables to an omelet or put greens in a smoothie. Being pressed for time is one of the main reasons women don’t eat enough in the morning. But the expression “Eat breakfast like a king, lunch like a prince and dinner like a pauper” holds up. Researchers found that overweight women who ate more calories at breakfast and fewer at dinner lost more weight and had greater waistline reductions than those who flipped the numbers, even when total daily calories were the same. The makeover: Aim for a combo of lean protein, healthy fat and good carbs in every breakfast. Instead of just yogurt, add in nuts and fruit. Bottom line: If you work normal hours, your dinner should never pack twice as many calories as breakfast.